A chance to own an original quilt made by Natalia Bonner & Kathleen Whiting. Alternating Stars was originally published in Modern One-Block Quilts. 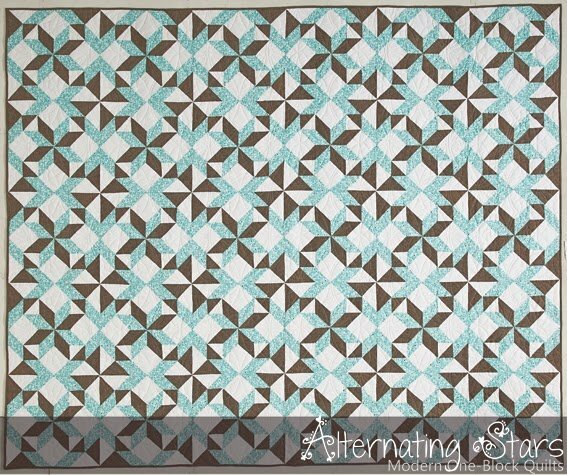 Alternating Stars is a striking quilt that appears to be two different blocks, a Pinwheel and an Eight-Pointed Star. It's really one large block with an eight-pointed star at the center. The block's corners form pinwheels when the blocks are set together. This quilt was made from high-quality Riley Blake quilting fabrics and was machine quilted by Natalia Bonner. Finished size is 75"x90".